Bobby Hawthorne is the son of a witch. His mother, a chef who owns a restaurant, has a secret she hides from her Texan neighbors. She can whip up more than one kind of magic in the kitchen. But Bobby, he’s normal. Just another teenage boy, going to high school, crushing on the new girl Angelina, joining his own garage band. Normal. Nothing out of the ordinary. His life no different than any other teenage boy even with a witch for a mother. But all that changes when Skip Macintosh walks into his life. He’s the new business partner for his widowed mother’s restaurant and Bobby’s not happy. He’s sure Skip’s up to no good. With Angelina’s help, he’ll delve into the truth and discover just what happened to his father. Oh, and stumble across a centuries old war between the fundamentalist Blackthornes and the witches they want to exterminate. Bobby and Angelina will have to learn fast about the hidden world of magic around them if they want any chance of surviving the darkness rising about them. Son of a Kitchen Witch is a phenomenal YA story. Hemlin has crafted a rich world of colorful witches living beneath the noses of normal people. Magic and wonder lurks around every corner. The characters are fun and populated by personalties that will keep you reading. Bobby is a solid character and has great chemistry with Angelina. The pair work well together. It was refreshing having the main character just no about his mother’s secret powers. It’s all so upfront in the beginning. I’m Bobby, my mom’s a chef, and she’s a witch sort of thing. To him, it’s nothing special. 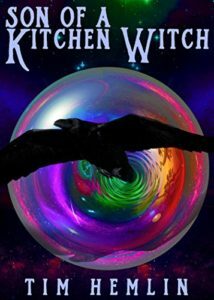 This is a great, fun read that puts a very American spin on the story of witches living among us in the real world, blending Texan culture and Native American mythology together into something unique and enjoyable. If you’re a fan of fast-paced, YA stories, then you need to give Son of a Kitchen Witch a read! Son of a Kitchen Witch is available from Amazon!